Instagram seems quite straightforward to us. You take a photo of a cool thing, slap on an even cooler filter, post it online and wait for the likes to come in. Maybe there’s some thought behind what kind of curated persona you’re presenting to the world, but that’s about as deep as it gets. Young people, on the other hand, have no memory of a world without the internet and have grown up alongside the emergence of mobile technology. As such, they are the first true digital natives and are known for being completely comfortable using digital platforms the way they were intended – and for discovering creative ways they were not. From using multiple accounts to a popular yet seemingly absurd brand of humour, this rings true for Instagram as well. And with such a huge amount of time spent by youth on the platform – 72% say they use Instagram – it’s important that educators, employers and marketers understand these online behaviours so they can best engage with and empower young people to make positive decisions about their future. In 2017, Instagram allowed users to create and easily switch between accounts, resulting in a growing trend of young people using multiple accounts for different purposes. A rinsta is a primary or ‘real account’ and conversely, finstas are their ‘fake accounts’. Gen Z use rinstas much the same way the rest of the population use Instagram, putting forward the best versions of themselves by choosing which parts of their lives to post and editing out the rest. Finstas, on the other hand, are generally designed to be more private than their primary accounts. Young people use them to share less curated and more personal content with their closest friends. Other times they’re used to follow or post around a specific interest. Some people even use them for completely personal reasons, having no followers and posting only for their own benefit. While creating finstas may not be a feasible marketing strategy for businesses, the motivation behind them is an important consideration. Your engagement can benefit from following youth in reframing negative associations of social media by turning away from overproduced, edited representations and pursuing more authentic content. 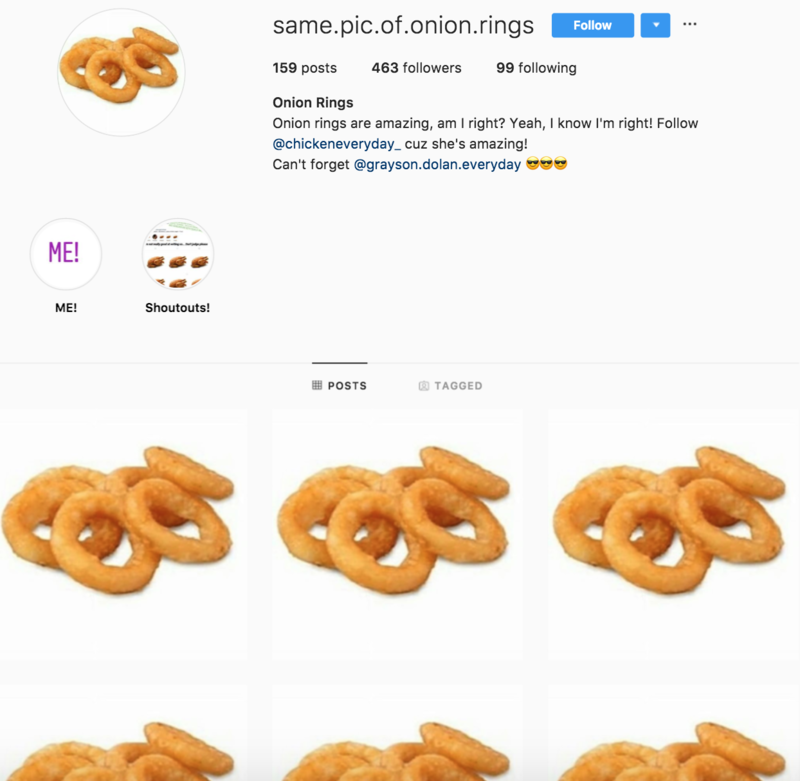 Out there in the wide world of Instagram is a growing number of accounts that simply post the same picture every day of a mundane household object, or something similar. There’s one for a toaster, crocs, watermelon, Steve Buscemi – even one for onion rings. It’s bizarre, almost absurd, and follows absolutely none of what a marketer’s intuition or training would predict to go viral. And yet, young people are getting literally thousands of followers on these accounts. What can we learn from this seemingly meaningless trend? Well, we can deduce that there are times when adults know very little about what content youth find worthy of their consumption, and what ends up being super popular can often fly in the face of our expectations. Our research backs this up, with 73% of young people saying older generations do not communicate with them effectively. This means that when older marketers try to produce content to resonate with Gen Z, it usually falls flat. Think about it – how many times have you seen businesses try to make memes, only to miss the point completely? It’s important that brands utilise youth voices to market to Gen Z in order to avoid this. If it’s not possible to hire young people in your business, consider reaching out to companies like ours that are embedded in youth culture to help you achieve effective engagement. One reason why same pic accounts have been able to become so popular despite absolute uniformity in the visual content they post are the captions and comments that follow. The young people that run these accounts often use these spaces to pose interesting questions to their followers, vent about their day or share funny stories, and their audiences respond enthusiastically by engaging with both the poster and other commenters. It’s not just happening on these accounts, but here is where it’s most prominent. In fact, look up any popular meme account and you’ll see each picture inundated with users commenting and connecting with strangers. This has happened because comment threads allow users to easily respond to each other, and young people are finding like-minded friends thanks to the initial Instagram photo anchoring them around a common interest. Some comments call for people experiencing depression or bullying to reply so that they can band together and provide support to each other. Not only are young people subverting the visual content Instagram was designed for, but they’re also calling out for a sense of community. Keep this in mind when curating your own brand account and know that professional looking photos aren’t the only thing young people look for on this platform. Ask questions to your followers, give them a space to express themselves through their comments and leave comments on other pages to grow your audience. It’s how youth use Instagram, so you should too.